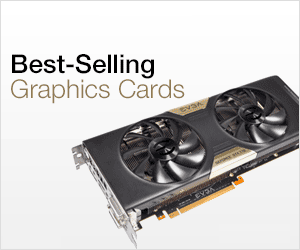 Graphics Cards does vast amount of graphics processing and during this they do get very hot. To prevent heating they are fitted with Heatsink and Fan combination which can lower down their temperature to normal levels. Heat Sink and Fan (HSF) is an important part of any graphics card. Some lower end or mid-range does come with only a big heatsink and no fan. This type of fanless cooling is called passive cooling while in active cooling both fan and heatsink is used. Passively cooled graphics cards are only good for building a silent PC and are not recommend for overclocking. For getting more performance and decent overclocking you will need a good active cooling solution for the graphics card having multiple fans. If you are not satisfied with the performance of your stock GPU cooler then you can use good Aftermarket GPU cooler to keep the graphics card temperature at lower levels. A good aftermarket graphics card cooler also allows you to overclock your graphics card further because it provides much better cooling than the stock cooler. 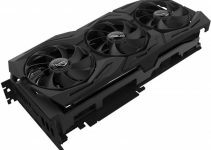 Here in this post I am going to provide you the list of best aftermarket GPU coolers for your Nvidia and AMD graphics card. Important Note: These Aftermarket GPU coolers are compatible only with graphics cards having reference design. They are not compatible with non-reference graphics cards that have shorter or extended PCBs (Printed Circuit Boards). 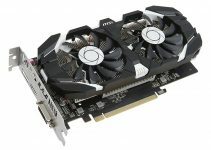 So before buying them you should be completely sure about your graphics card size and then make the final decision on which aftermarket graphics card cooler to buy. These aftermarket graphics card coolers provides cooling to all important components of your graphics card that includes GPU, Memory and VRM (Voltage Regulator Module). Along with GPU, Memory and VRM also gets pretty hot so they should be properly cooled down too otherwise you graphics card may fail. Here are the best aftermarket graphics card coolers or VGA coolers for both Nvidia and AMD based graphics cards. This is a budget graphics card cooler that delivers high performance and very good cooling for your GPU and other graphics card components that includes VRAM and VRM. 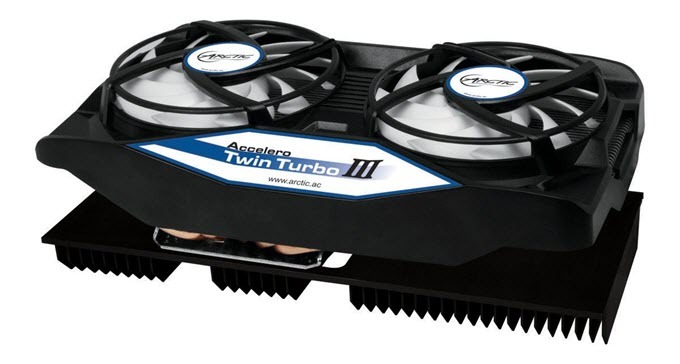 Arctic Accelero Twin Turbo III Graphics Card Cooler comes with two 92mm fans and includes heatsinks for VRAM and VRM. It has 250 Watts of Cooling Capacity which means it can cool down even the high-end graphics cards. You should have a good mid-tower or full tower case for this graphics card cooler because it is fairly big and can take upto 3 slots in your case. It comes with MX-4 thermal compound pre applied which means you don’t have to buy thermal paste separately. Even with two fans this GPU cooler remains very much silent compared to the stock coolers. This graphics card cooler delivers excellent performance and you can expect up to 20 degree Celsius decrease in temperature which is great. The cooler comes with proper instructions for its installation and does not require thermal glue for installing it. It is compatible with latest NVIDIA GeForce GTX 1060/1070/1080 and AMD Radeon RX 480 Graphics Cards. Note: Accelero Twin Turbo III is compatible only with the graphics cards using a standard size PCB with a width of 98mm. Titan X (Pascal), GTX 1080, 1070, 1060, Titan X, 980(Ti), 970, 960, Titan*(Black*), 780(Ti*), 770, 760, 750(Ti), 680, 670, 660(Ti), 650 (Ti,Ti boost), 580, 570, 560 (Ti,SE) , 550 Ti, 480 ,470, 465, 460(SE) ,GTS 450 , 250, 240 (OEM), 150 (OEM), GT 740, 640, 340, 330, 320, 130 (OEM), 9800 (GTX+, GTX, GT), 9600 (GT, GSO 512, GSO), 8800 GTX (G80), 8800 GTS (G80), 8800 GTS 512 (G92), 8800 GTS (G92), 8800 GT, 8800 GS (9600GSO), 7950 GT, 7900 (GTX, GT, GS), 7800 (GTX 512, GTX, GT), 6800 (Ultra Extreme, Ultra, GT, GS AGP, GS, AGP, XT AGP, XT, LE) ,6600 (GT AGP, GT, LE, DDR2). RX 480, RX 470, RX 460, R9 380(X), 370X, 285, 270(X), R7 370, 360, 265, 260(X), 250(X), 240, HD 8870, 8760, 7870(XT ,GHz) ,7850 ,7790, 7770 (GHz) , 7750, 7730, 6970, 6950, 6870, 6850, 6790, 6770, 5870, 5850, 5830, 5770, 5750, 4890, 4870, 4850, 4830, 4770, 3870, 3850, 2600XT, X1950 (XTX, XT, Pro, GT), X1900 (XTX, XT, GT), X1800 (XT, XL, GTO), X1650 (XT, Pro), X1600 (XT, Pro), X1550, X1300 (XT, Pro). This is a high-end graphics card cooler that is even bigger than Accelero Twin Turbo III. It comes with a longer or extended heatsink and three 92mm fans for providing excellent cooling. ARCTIC Accelero Xtreme IV has cooling capacity of 300 Watts which makes it an excellent choice for the top-end and ultimate graphics cards such as Nvidia Titan X or GTX 1080. The heatsink design consists of aluminum fins and several copper pipes and direct copper contact with the GPU. The installation is fairly easily and it does not require any gluing. It also provides a backplate cooler or heatsink for cooling down VRAM and VRM. The performance of this graphics card cooler is top notch and you can expect up to 25 – 30 degree Celsius drop in temperature compared to the stock cooling. It comes with MX-4 thermal compound which adequate and you have to buy any more thermal paste. This graphics card cooler is compatible with latest high-end graphics cards that include Nvidia GeForce GTX 1060/1070/1080 and AMD Radeon RX 480. Note: Accelero Xtreme IV is compatible only with the graphics cards using a standard size PCB with a width of 98mm. Titan X (Pascal), GTX 1080, 1070, 1060, Titan X, 980(Ti), 970, Titan (Black), 780 (Ti), 770, 760, 750 (Ti), 680, 670, 660 (Ti), 650 Ti (boost), 580, 570, 560 (Ti,SE), 550 Ti, 480, 460(SE), GTS 450, 250, 240 (OEM), GT 740, 9800 (GTX+, GTX, GT), 9600 (GT, GSO 512, GSO), 9500 GT (not LP), 8800 Ultra (G80), 8800 GTX (G80), 8800 GTS (G80), 8800 GTS 512 (G92), 8800 GTS (G92), 8800 GT, 8800 GS (9600GSO), 7900 GTX, 7800 (GTX 512, GTX, GT). RX 480, RX 470, R9 390(X), 380(X), 370X, 290(X), 285, 280(X), 270(X), R7 370, 265, HD 8870, 7970 (GHz), 7950 (Boost), 7870(XT, GHz), 7850, 6970, 6950, 6870, 6850, 6790, 5870, 5850, 5830, 4890, 4870, 4850, 4830, 3870, 3850. This is the topmost aftermarket graphics card cooler that you can get for your midrange or high-end graphics card. It is a hybrid cooling system that consists of Water Cooling for GPU and Heat Sink Fan (HSF) for VRAM and VRM. The Fan for the Radiator in Water Cooling unit is 140mm in size and the fan for VRM and Memory is of 80mm. It comes with ARCTIC MX-4 thermal paste which is one of the best thermal compounds around. This graphics card cooler is for hardware enthusiasts and overclockers who want to squeeze out maximum performance from their graphics cards. This cooler is virtually silent in operation and its performance is really huge. You can expect up to 40 – 45 degrees (°C) drop in GPU temperature as compared to stock cooler. This is really amazing performance and the whole water cooling unit is not expensive either. You cam this hybrid graphics card cooler at around 100 dollars. It is compatible with variety of graphics cards including the latest GTX 1080 / 1070 / 1060 and RX 480. 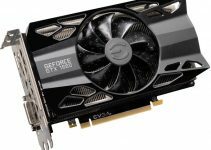 At the end I would like to say that I have listed down the best aftermarket graphics card coolers that can keep your graphics card GPU, VRAM and VRM temperatures well under control. The only thing that you should keep in mind before buying them is to make sure that they fit your graphics card perfectly otherwise you might be wasting your money.